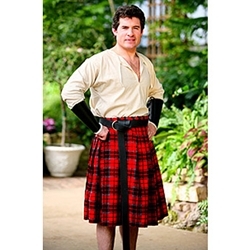 These Field Kilts or Scottish Kilts are cotton kilts, the ultimate in comfort and style. They are made from 7 yards of cotton plaid and have the pleats sewn in. To wear, simply wrap around and fold down. Use a kilt pin or cloak pin (not included) to help ensure modesty. Patterns will vary.